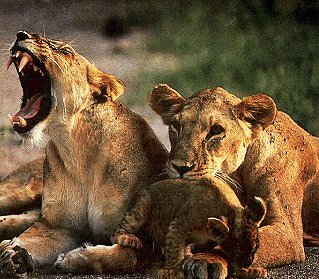 Travel picture of A family of lions in Kenya. The Okavango Delta (or Okavango Swamp), in Botswana, is the world’s largest inland delta. The area was once part of Lake Makgadikgadi, an ancient lake that dried up some 10,000 years ago. Today, the Okavango River has no outlet to the sea. Instead, it empties onto the sands of the Kalahari Desert, irrigating 15,000 km² of the desert. Each year some 11 cubic kilometres of water reach the delta. Some of this water reaches further south to create Lake Ngami. The waters of the Okavango Delta are subject to seasonal flooding, which begins about mid-summer in the north and six months later in the south (May/June). The water from the delta is evaporated relatively rapidly by the high temperatures, resulting in a cycle of cresting and dropping water in the south. Islands can disappear completely during the peak flood, then reappear at the end of the season. The water entering the delta is unusually pure, due to the lack of agriculture and industry along the Okavango River. It passes through the sand aquifers of the numerous delta islands and evaporates/transpirates by leaving enormous quantities of salt behind. These precipitation processes are so strong that the vegetation disappears in the center of the islands and thick salt crusts are formed. The Okavango is home to a prosperity of wildlife and attracts thousands of visitors a year. There are camps within the delta region that cater to these visitors. The delta provides a seasonal habitat to numerous different species. Among these are African Bush Elephants, the African Buffalo, the Hippopotamus, the Lechwe, the Topi, the Blue Wildebeest, the Giraffe, the Nile crocodile, the Lion, the Cheetah, the Leopard, Brown and Spotted Hyenas, African Wild Dogs, the Greater Kudu, the Sable Antelope, both the Black and the White Rhinoceros, the Plains Zebras, the Warthog and the Chacma Baboon. The delta also includes over 400 species of birds, including the African Fish Eagle, the Crested Crane, the Lilac-breasted Roller, the Hammerkop, Ostrich, and the Sacred Ibis. The Okavango Delta has been under the political control of the Batawana (a Tswana sub-tribe) since the late 1700s. Most Batawana, however, have traditionally lived on the edges of the Delta. Botswana is dominated by the Kalahari Desert, which covers up to 70% of the land surface of the country. The Okavango Delta, the world’s largest inland delta, is in the northwest. The Makgadikgadi Pan, a large salt pan lies in the north. Botswana has diverse areas of wildlife habitat, including the Okavango Delta, the Kalahari Desert, grasslands and savannas, the latter where Blue Wildebeest and many antelopes as well as other mammals and birds are found. Northern Botswana has one of the few remaining large populations of the endangered African Wild Dog. Botswana’s principal tourist attractions are its game reserves, with hunting and photographic safaris available. Other attractions include the Okavango Delta region, which during the rainy season is a maze of waterways, islands, and lakes. The tourism industry also helped to diversify Botswana’s economy from traditional sources such as diamonds and beef and created 23,000 jobs in 2005. Animals in the Okavango Swamp include elephants, buffalos, hyenas, wild dogs, buffalos, hippos and crocodiles. There is a wide variety of antelope and other animals such as warthogs, mongoose, red lechwe, spotted genets, monkeys, bush babies and tree squirrels. The predators include lions, leopards and cheetahs.